I am so excited about this product, I just had to share not only for Airstreamers who Boondock (dry camp) but, for all RV’ers! As you all know, I consider myself a Glamper. I want to be out in nature as much as I can but, at the end of the day, I want a cozy travel home to cook a sumptuous meal, enjoy a fine glass of wine, take a hot shower and sleep in a uber comfy bed ~ hence, Glamorous Camping. Well, there will be times when Hub’s and I will be boondocking or at a campground with limited hook-ups. And I mean, NO WATER!!!! The thought just about makes me cringe. I am a shower/bath girl and like to wash daily. So, when I discovered this product, I was elated at the thought of no water but, will still be able to show my face (or hair) in public after using this amazing dry shampoo by Klorane. Not just for us ladies, this dry shampoo will be awesome for your man and kids! 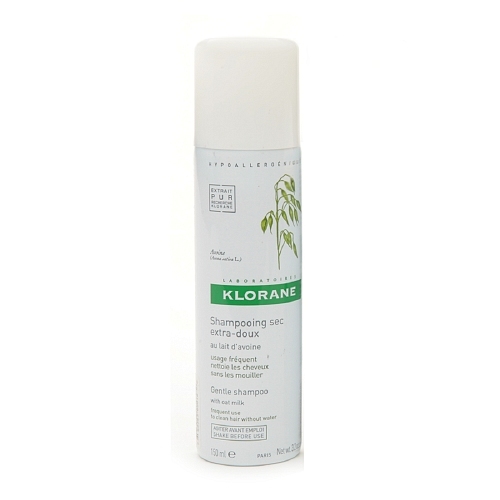 The Klorane Gentle Dry Shampoo is made with oat milk so its very gentle. I purchased a bottle from Drugstore.com and tried it this past weekend. It was just what I expected, it helped me get through another day or two without having to wash my hair in the shower. Just spray it on your roots and wait for about 2 minutes then brush out. Don’t be shocked as it looks like you have sprayed talcum powder on your head but, it brushes right out along with the oil from your scalp. So, if you are in a pinch and don’t have water or really need to conserve it, this dry shampoo will be your saving grace! Made with softening and protective oat milk, this paraben-free, sulfate-free and sodium chloride-free dry shampoo cleans hair without water. Corn and rice starch for powerful cleansing action and natural microspheres (cyclodextrins) to eliminate dirt, oil, and odors. Hair regains volume and lightness within minutes! Quick and practical to use, it’s ideal for traveling, people on-the-go, after the gym and busy moms. Perfect for extending a blow-out and protecting hair color. Ideal to provide texture for an updo – no bridal updo without! Our Airstream will be stocked with Klorane Gentle Dry Shampoo for those times when we must really conserve our water. Enjoy! Thanks, Anna! My mom was bedridden this summer and e searched everywhere for a good dry shampoo. Now I’ll have one if she ever needs it again!